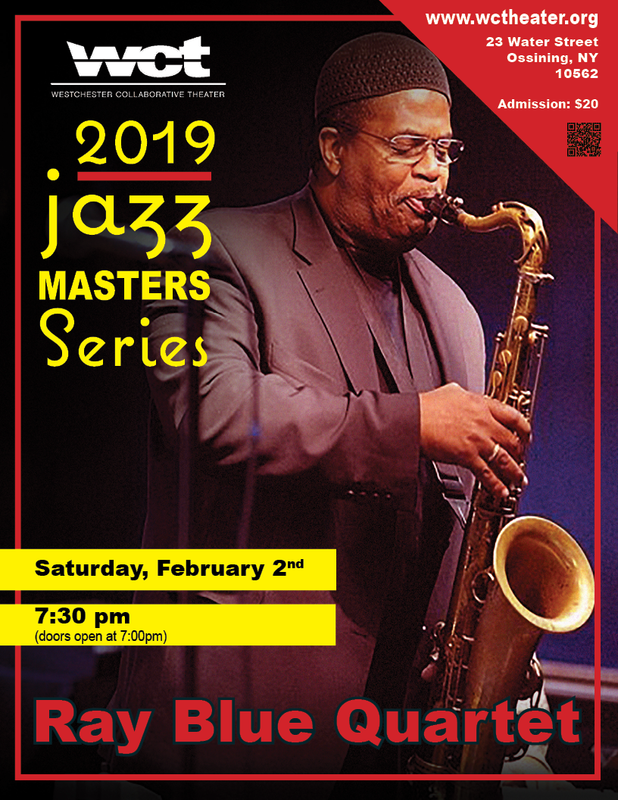 On Saturday February 2nd WCT kicks off the 2019 Jazz Masters series by welcoming back the Ray Blue Organ Quartet, featuring world-renowned tenor saxophonist Ray Blue of Peekskill, a New York Blues Hall of Fame inductee who has toured extensively throughout Europe, Asia and Africa. Saxophonist, composer, arranger and educator Blue, who has appeared at “Africa’s Grandest Gathering,” the prestigious Cape Town International Festival, will share the stage with organist Jared Gold and drummer George Grey. Blue’s music has been described as a fusion of straight ahead jazz and rhythmic groove. He has appeared with the likes of Alicia Keys, the Cotton Club All Stars, John Gilmore and many others. A former cast member of the “Ray Charles Show” which toured in Europe, his festival performances also include the Hartford Jazz Festival; European Union Annex Festival-Dublin, Ireland; Audi Jazz Festival in Brussels; and the Macao Jazz Festival in China. Ray Blue has been honored with the Iowa Juneteenth Jazz Legacy Award, the Arts Education Award, and with Peekskill Middle School’s Living Legacy Award for his devoted contribution to introducing young people to music and to encouraging intergenerational sharing of the arts. He consults and presents at schools, colleges, universities and community institutions around the world and is the founder of Cross-Cultural Connection, Inc. a 501 (c) 3 non-profit organization that promotes jazz culture, performance and education. Blue holds a graduate degree from the University of Iowa, and is an alumni of Wm. Penn University which annually presents “The Ray Blue Jazz Award” in his honor. Organist Jared Gold won the 2013 Rising Star on Organ critics poll in DownBeat Magazine and tours internationally with many well-known jazz artists. Find out more about Ray Blue on his website!